Inspired by the playful favorite of kids everywhere, this chic Froggie & Friends New Baby Gift Basket is the perfect gift for your favorite new mom! 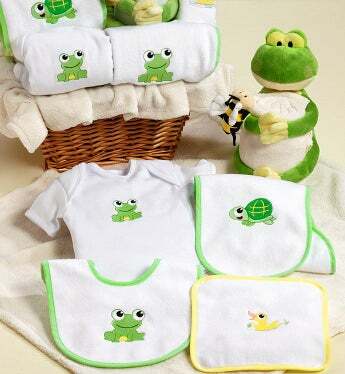 She’ll absolutely adore this beautiful, 100% cotton layette gift basket that doesn’t dally when it comes to high-quality frog, turtle and duck-embroidered baby basics. Whether she’s having a girl or boy, this gift basket includes absolutely everything she needs to nurture, love and care for her new bundle of joy including a super soft plush baby blanket, an embroidered bodysuit, a terry cloth baby bib, 2 burp pads, washcloth and a wrist rattle. Plus, there’s even a super soft and cute plush frog holding his favorite stuffed bumble bee buddy. Inspired by the playful favorite of kids everywhere, this chic Froggie & Friends New Baby Gift Basket is the perfect gift for your favorite new mom!